Sir Richard Branson, one of the world’s most famous entrepreneurs, has been signing the praises of a host of UK start-ups. 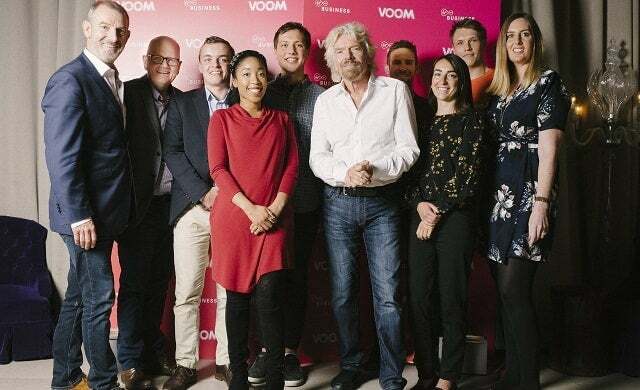 Meeting with the winners of Virgin’s Voom Pitch, the UK and Ireland’s biggest business pitching competition, the self-made billionaire presented each business with £5,000 worth of funding – as well as discusing areas for growth and improvement. Held annually, The Voom Pitch competitions take place aboard the Voom Bus – in the city centres of London, Dublin, Belfast, Newcastle, Manchester, Birmingham and Cardiff. Saint Aymes produces handmade artisan chocolates artisan chocolates, hand painted with 23ct gold, enriched with opulent colour and inspired by artistic greats. Coroflo, a breastfeeding device which tracks real-time information on a baby’s feed, including the amount of milk that a baby is drinking. TapSOS provides a simple, four-step process via an app for those unable to call 999 via the normal means. This could include deaf people, victims of domestic abuse or those involved in a terrorist incident, where it may be unsafe for people to telephone for help. Storage Shepherd provides an online platform that allows people to rent out spare space in their house, garage, shed or driveway, for others to use as storage. GoSweat provides an online platform that allows people to enter a keyword or location and instantly see a list of exercise options near them, whether that be gyms, personal trainers, fitness classes or sports clubs. Project Jackfruit uses the highly nutritious, but relatively unknown humble jackfruit to create a delicious meat alternative that’s all natural, 100% vegan and gluten-free. The jackfruit is sustainably and ethically sourced and available to purchase online. TrekinHerd provides a social community for outdoor adventurers and backpackers on a global scale, where users can blog their experiences, connect with friends, meet other adventurers, and discover new places to visit. “The Voom Tour is seeking out brilliant entrepreneurs and ideas to help break down the barriers to business success. “The aim is to help them put aside their fears and take the next steps on what could be the most significant journey of their business life. Later this month on Thursday November 16, Startups is partnering with Virgin Media Business to hosting an expert panel of famous entrepreneurs at the citizenM Glasgow hotel. Part of a nation-wide series, Transform Your Business – The Power of Digital will explore the digital necessities for future business success: from using clever digital marketing to improved IT infastructure to quickly enhance user experience and better engage and convert consumers. Chaired by Startups own Megan Dunsby, panelists include Leah Hutcheon of Appointedd, Cally Russell of Mallzee and Virgin Media regional director Martin McFayden. To register for free tickets click here.